Spectacular plant with large colourful blooms sitting atop its handsome green foliage. These eye-catching beauties in such a marvelous array of colours are usually offered for sale as gift plants or decorative houseplants around festive seasons in garden centres and hypermarkets. Hence, I grabbed the opportunity to capture some shots of them, displayed at a nearby Tesco Store a few weeks before the 2010 Lunar New Year. With proper care and attention, Sinningia speciosa can flourish and churn out fabulous blooms to brighten and decorate your home or office. 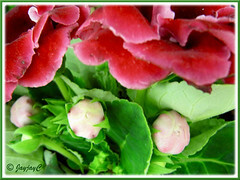 We’ve never grown Florist’s Gloxinias before. So far, John and I have avoided bringing any Gloxinia home, regardless of how beautifully attractive or tempting they may be. That doesn’t mean we’ve ceased admiring them. Having failed previously in our attempt to grow African Violets which are closely related, we just can’t bear loosing them sooner than expected! 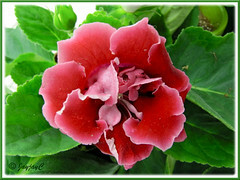 Nevertheless, having researched for this article, and know a little better about Gloxinia care and culture, we now have second thoughts. Should we desire one, must remember to choose a plant with healthy leaves and plenty of flower-buds to start off! Etymology: Named after Benjamin P. Gloxin, an 18th-century German physician and botanist who first described it. Features: Sinningia speciosa, originally classified under the genus name, Gloxinia, is now a species of Sinningia, a genus of perennial tuberous herbs and shrubs of Central and South America. A herbaceous plant that grows to about 30 cm tall or more and has fuzzy-textured green leaves with serrated margins. The large blades are oblong and paddle-shaped, deeply veined and tightly packed along the stem. Over the years, numerous hybrids and varieties have emerged due to extensive hybridization. The present day hybrids of S. speciosa, Florist Gloxinia bear little resemblance to the ancestral or true species. They are more compact and produce large blooms held on long petioles, in gorgeous colours. They can either be in solid colours or two-toned, speckled or otherwise with deeply coloured or spotted throat, and appear in various forms too. Colours range from varying intensity of red, scarlet, magenta, pink, purple, blue-violet, lavender, white or near white. Bell-shaped and velvety textured blooms can be single or double flowering types, with plain and smooth or wavy and ruffled petals. Not unusual at all for a large and mature plant to have 2 dozen or more large flowers (over 3 inches across) blooming at any one time. Healthy plants will keep producing numerous buds as the earlier ones fully bloom and wither, over an extended period of 2 months or more. After flowering, the plant and tuber will enter a dormant stage where the leaves begin to yellow and die back, lasting about 6-9 weeks, and then with proper care come back afresh as new plants from its tuber. 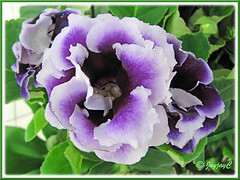 Culture (Care): Sinningia speciosa or Florist’s Gloxinia can be grown as gorgeous house plants, living for several years if given proper care and attention. Light: Bright indirect light but strictly no direct sun, or florescent lights for 12-14 hours per day to promote good flowering. For best growth, the ideal daytime temperature is 75°F and a nighttime temperature of 65°F or warmer. Avoid cold drafts as these are warm-loving plants. Moisture: Water carefully, keeping it evenly moist. Do not over-water or allow soil to be waterlogged that may lead to crown rotting. Water directly on soil and never on flowers and leaves, as water causes unsightly marks/spots/holes on them. It requires high humidity which can be maintained by standing the pot on some pebbles in a tray of water or use a humidifier. Soil: Fertile humus soil with a mix of coarse sand that can retain water, yet drains well. The pH should be 5.5-6.5. Others: Feed every 2 weeks with a balanced fertilizer for houseplants (15-15-15) until the flowering season ends where feeding should cease in preparation for dormancy period (refer to link below about winter-rest). Remove spent flowers and withered foliage. Plants do not like to be root-bound, so repot when necessary. To encourage bushiness and flowers to develop together for an impressive display, pinch off the first 2 flowers as they start to develop. 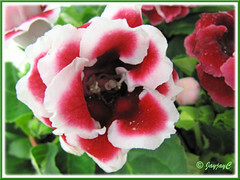 Florist’s Gloxinia are generally free from pests, but do check occasionally for mites and thrips. For subtropical regions: Hardiness: not applicable as they can be grown indoors. 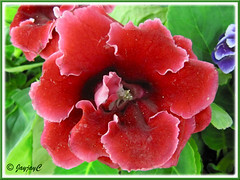 Gloxinia requires a period of dormancy or winter-rest after flowering, usually around October/November in Northern Hemisphere until spring. During this time, water should be gradually reduced and feeding stopped to allow the soil to dry out and then store the pot in a cool place, ideally with temperature around 55-60°F. When tuber show sign of new growth in early spring, pot it in fresh soil with hollow side up and level with the medium’s surface, and start watering gradually. 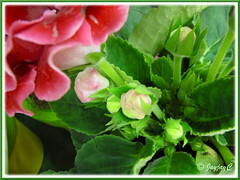 Learn about caring for Gloxinia during the winter-rest. Propagation: By sowing seeds that will eventually flower in 6-9 months or even as early as 4-5 months if provided with optimum growing conditions. Sowing the seeds over a staggered period will ensure a succession of blooming plants throughout most time of the year. 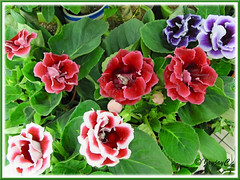 Usage: Grow Gloxinia as an ornamental potted indoor or house plant to decorate and beautify your homes and offices or in greenhouses. 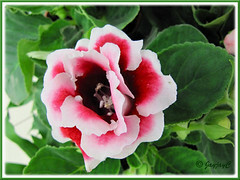 Be inspired to grow Gloxinias at Senior Gardening! It is truly a beautiful plant. I had overwatered it and the whole thing turned yellow and rotted. This one is a real challenge for me as I had failed twice. The rainy days didn’t help either, as water seemed to be the no.1 killer for this plant. Since my garden is very much in the shaded area, it had added the contributing factor of wet soil and the drying effect takes much longer than expected. Good luck and hope you get many many blooms from this plant. We’ve yet to bring this beauty home for fear of killing it too soon and get our bucks burnt…haha! But thanks all the same, James, we’d need those wishes when we do start growing one, seems a tough nut to crack!